In the framework of collaboration between IITA and the Royal Museum for Central Africa, Tervuren, Belgium, hoverflies preserved in IITA’s biodiversity center at Cotonou were recently studied using molecular biology techniques in support of morphological identification. Surprisingly some specimens from Benin and Cameroon could not be identified using existing morphological keys for Syrphidae of the Afrotropical region. ecology. Zootaxa: 4044 (4): 567–576. DNA sequencing and comparison with publicly available barcode data revealed the presence in Africa of a species originating from South America. While subsequent collection efforts showed that the species named Toxomerus floralis (Fabricius) is currently widely spread in Togo, Benin, Nigeria (including the IITA campus at Ibadan), and Cameroon, the full extent of its geographic distribution within the African continent remains to be determined. 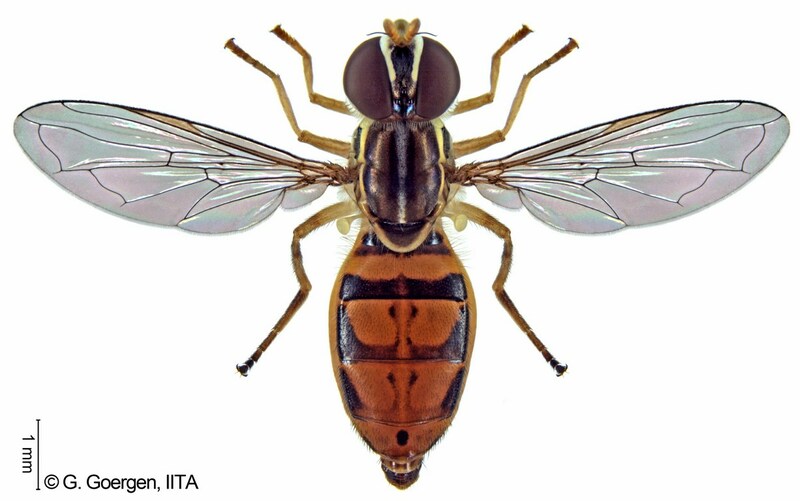 This is only the second known established introduction of a non-African hoverfly species in the Afrotropics. Interestingly, the larvae of this species feed on pollen, which is uncommon within the subfamily Syrphinae. Moreover, it is the only Syrphinae species of which the larvae feed on pollen of at least two plant species from different families (Cyperaceae and Rubiaceae). This example illustrates well the practical application of molecular techniques as a reliable identification tool and underpins the utility of any contribution to such a globally accessible database. (Please contact g.goergen@cgiar.org for full scientific article).